A few weeks ago we went to the Winter Springs Spring Fever in the Park Festival. This was our second year attending and we had a great time! We brought Harley, our mini dachshund, and she was surprisingly well behaved. She is an old girl who is not very social but she managed to enjoy herself without barking too much. 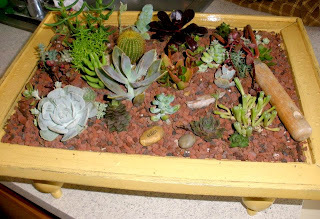 Last year Jess bought me the most beautiful succulent garden made from a vintage frame. Its a year later and by some miracle its not only alive but thriving! 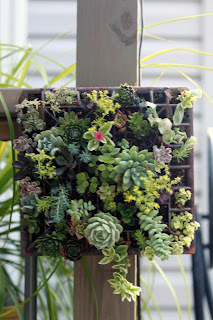 The minute I saw this garden, I was in Love! It was so unique and I had never seen anything like it. 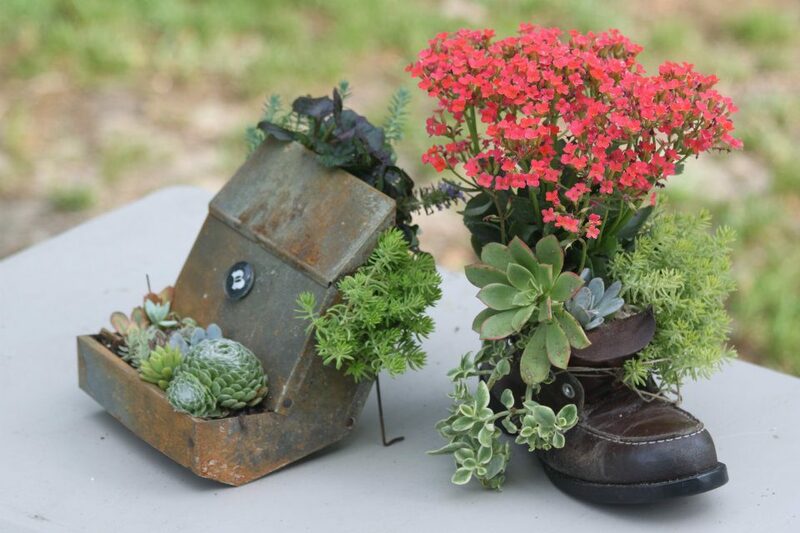 The woman who makes them, Linda, from Rusty Gate Gardens has such an eye for putting things together. This is a vintage frame which she builds a base for and adds feet. A shabby chic paint effect is added for a beautiful look. I could stand in her booth forever! 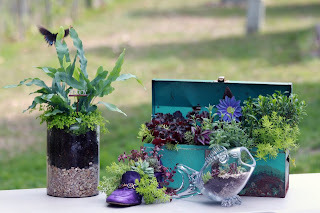 She tucks the most interesting treasures into each one of her gardens. This one has a rusty trowel and a little rock that says trust. This year I was entranced by this adorable muffin tin! I kept coming back to it saying how cute it was. 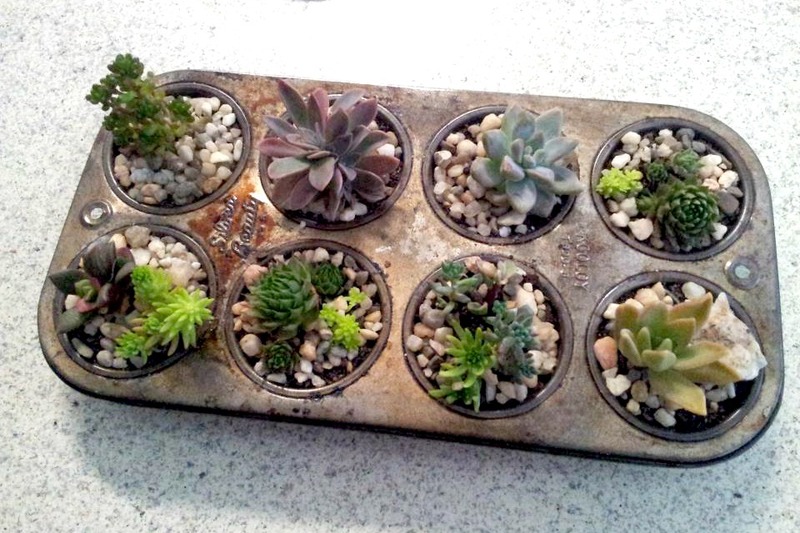 It reminded me of my mom who collected more muffin tins any one person would use in a lifetime. 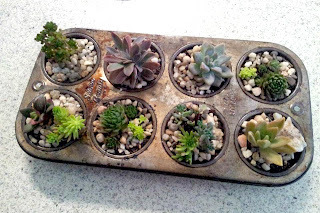 I was thinking I would have to be careful to avoid over watering but realized Linda had added holes for drainage in each cup. This was so retro! 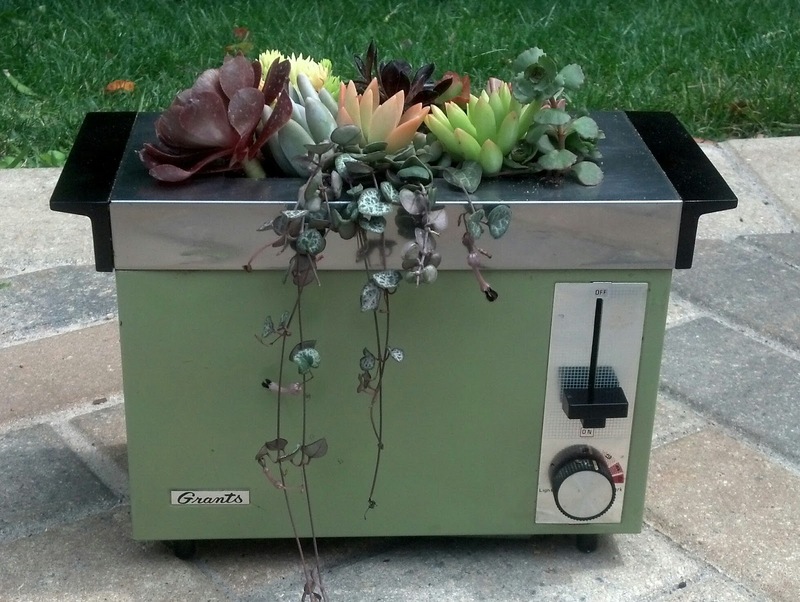 A toaster...I don't think I could have ever envisioned a toaster as a planter but it works! I can totally see this in a kitchen. More adorable planters...an old shoe, now that is recycling! Who doesn't have an old shoe lying around? 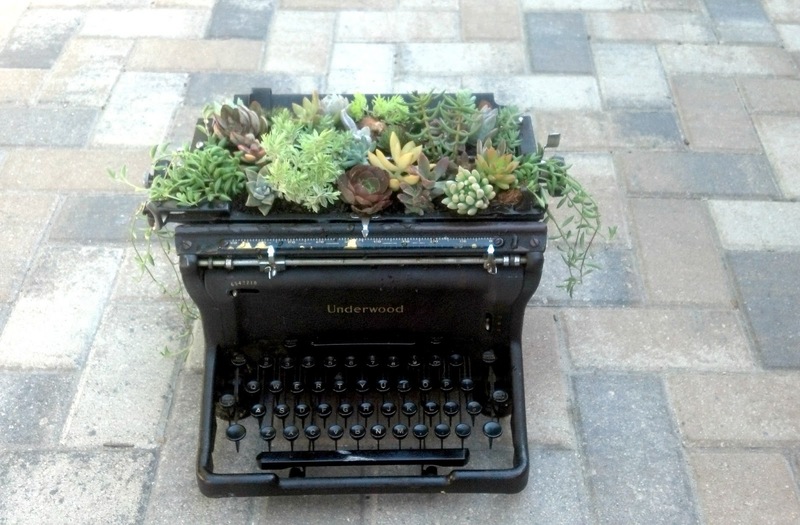 What a great planter! Some more beautiful garden collections, a vintage tool box, old shoe and assorted glass containers.The tool box is fantastic! 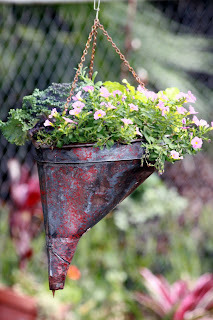 Anything can be a planter, even a funnel turned upside down. No need to worry about drainage here. This would look perfect on a country porch. I am kicking myself for not keeping my old mailbox. It had a perfect weathered patina perfect for plants. The footed frame in the photo is a smaller version of the one we bought. It really is an interesting conversation piece. Everyone who sees it, loves it! I almost bought this! This hangs on the wall and I knew there would be no way the animals would get into it! 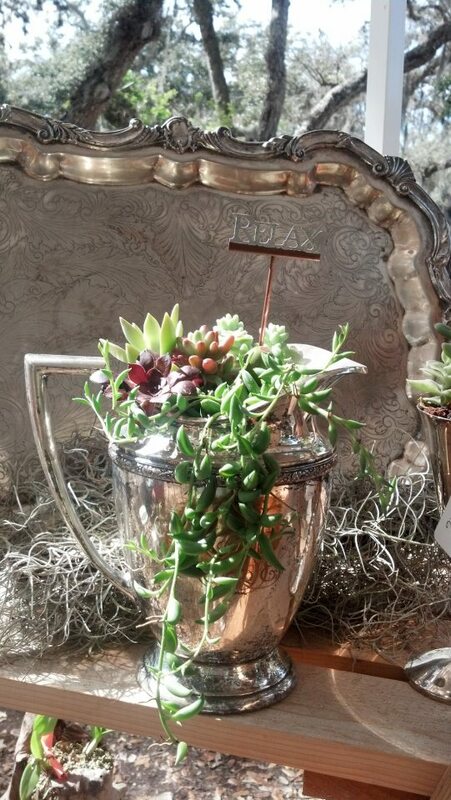 I just bought a little tea set from an estate sale so that I can plant all the babies in it just like this. Our garden has grown so much in a year that we have had to do a major trimming. The great thing about succulents is that you can root them to grow easily. 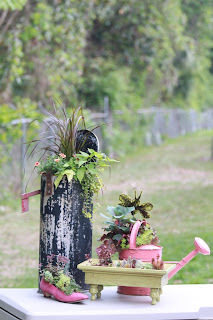 Please check out Linda's Facebook page Rusty Gate Gardens to see where she will be next. You will not want to miss a chance to see her beautiful creations! Lazy Day Cottage Visit Lazy Day Cottage 's profile on Pinterest. Who Knows How Much An Inch Is Anyway?